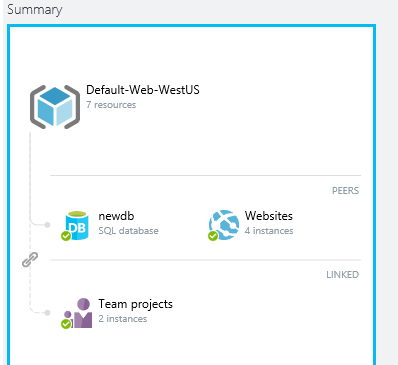 Azure - Azure linked Resource: Web app + SQL db. What does it actually do? Im using Azure to develop and host my website. Im using an SQL db located in Azure. I have linked my Web App to the SQL db.. But what is the use of it? What changes for my web app that it is not linked to my db? I mean, I have already added the connection string to my web.config so what does the Linked Resource do? How can it be used? UPDATE: It seems like this linked ressource actually has some usefull feature. When I link my Web App to my SQL db, the Web App is always connected to that db no matter what I might be using on my own machine. The publish profile and the linked db makes sure to replace the connection string to the correct one as found in the linked db ressource. Very cool! This Means that when I develop the website and use my local db, I can just use the publish profile from the web app and then the connection string is auto updated during the publish process. The connection string on my local web.config remains the same. Nice nice..